Seriously, get over it. So the kid put on a woman’s outfit for the day. Admittedly Quinn is somewhat sexualized in media. However, women are simply very often sexualized. But even that concern was secondary for most people it seems. 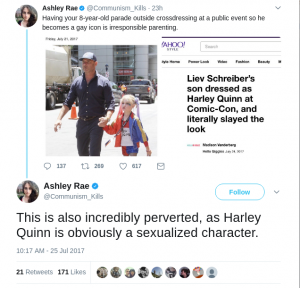 Consider this tweet by Ashley Rae. As you can see, she did realize that she should be outraged by something more than a boy dressing as a girl. But it was only an after thought. Now, if there was anything to be outraged at it is not the fact that Quinn is a woman, but the fact that Quinn is a mentally unstable criminal who is clearly suffering from Stockholm syndrome. But you do not see the right mentioning that or being concerned about that. Nope. It is simply a matter of the boy wearing a dress. Oh wait. It’s not even a dress. It is a shirt and shorts. So grow up people. It is Comic-Con. It is COSPLAY. And even if it were simply how the kid wanted to dress, then whatever. If you have no issue with a female wearing that outfit, then you should not have an issue with a male wearing it. The post Right Wing Priorities: Liev Schreiber Outrage appeared first on Politicoid. The Johnson Amendment is seen as a legal tool for limiting religion. But it is actually not specific to religious institutions at all. Yet it is often applied disproportionately, especially when it comes to cases with ambiguity such as NPR’s indirect politicking. There are a few issues with the Johnson Amendment. The first is that it was poorly conceived in the first place. It was a reaction to a non profit organization badmouthing Lyndon B. Johnson while he was running for his senate position. The second issue is that it is unconstitutional. It creates a conflict between the First Amendment and the Sixteenth Amendment. Conflicts between amendments must be dealt with in the least restrictive way. This is the general practice when dealing with conflicts in contracts (Stack Exchange). The least restrictive way of dealing with the conflict would be to eliminate the legislative act creating the conflict. This is reasonable because legislative acts always take lower priority than a provision in the constitution. Another minor issue is the one that I have with institutions like American Atheists. It is clear that their issue is with religion, and not with upholding the Johnson Amendment. For one thing, many of their followers think that the law prevents all religious institutions from engaging in politicking. This often coincides with the incorrect belief that no religious institutions pay taxes. That is not true. Only 501(c)(3) non profit organizations are prevented from politicking and it is that status which protects many churches from paying taxes. But that also means that every other 501(c)(3) non profit entity should be blocked from politicking. But NPR has generally been immune from this restriction. Part of this immunity derives from the ambiguity regarding what constitutes politicking. Direct support or opposition of a candidate, engaging in activities to help fundraising for a candidate, etc are clearly politicking. NPR does not engage in any of these activities. However, it goes well beyond simple reporting. It editorializes candidates and parties. There is a clear track record of being critical of Republican candidates and politicians. There is a distinction reporting and editorializing. If a candidate’s actions, positions, etc are editorialized in a positive or negative way, this should reasonably be considered politicking. There is no difference between repeatedly editorializing a candidate in a positive way and endorsing that candidate. If an institution said “candidate X will be great for this country, everything we ever wanted will come true” that is an endorsement if candidate X, even if they never come out directly and say “vote for candidate X.” I pushed Atheist Republic on this issue after a tweet on the topic, but the admin of the Twitter account went silent. The post The Johnson Amendment appeared first on Politicoid.